The reason that most roofs are dark is to absorb the sun’s heat. And since heat rises, that puts your attic as one of the hottest zones in your home. In fact, it can be 50° warmer than the rest of the house. The goal is to have your attic properly insulated. That way it will act as a tight seal to keep cool and warm air from escaping. Do you know what is the recommended level of insulation for your area? It’s a good thing to look up and to measure in order to make sure your attic is properly insulated. While you’re at it, it might be a good idea to install and attic fan to help push hot air out of your attic. That can help keep moisture from building up. A lot of water goes right down the drain. That especially happens when you were showering. The average family can use up to 40 gallons of water per day. A low-flow showerhead allows just for two gallons per minute to flow out versus the typical 5 gallon per minute. That can be some very substantial savings. The same thing happens with your toilet. Each flush can be as much as 6 gallons of water used versus one and a half gallons with a low-flow toilet. Clearly, the best way to go green is to add green. If you have the room in your backyard, then it will be a good idea to plant a tree or more shrubbery. The trees can take a few years to fully bloom but it will be a very positive impact on the environment and even increase your home value. Instead of holding onto all your e-waste such as old computers and televisions, you should turn that over to Junk King Cleveland. Junk King has been a green company since they began collecting junk over 12 years ago. 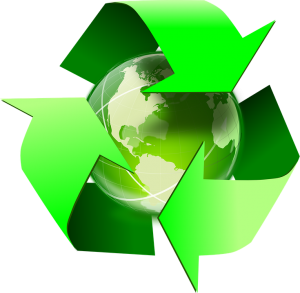 They’ve identified all the proper recycling facilities in the Cleveland area and will happily make drop-offs of all of your recyclable materials. They’ll even repurpose things like furniture, clothing and other household goods by donating them to charities. When it comes to hauling junk, Junk King Cleveland is your green ally. This entry was posted in Cleveland Junk Removal and tagged green, Junk King, recycle, rubbish on August 31, 2017 by Junk King. Last updated August 31, 2017 .